Happy Easter everyone and happy new beginnings! 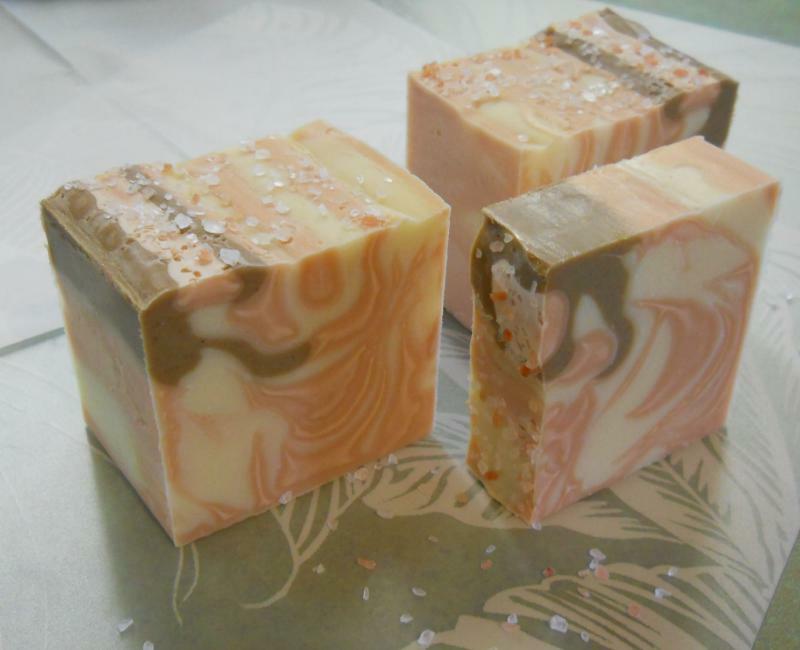 Amy of Great Cakes has presented a new challenge for 2013 and it is Tiger Stripe Soap! New beginnings in the soaping community! Thank you Amy and Co for stirring the imagination yet again! Having spent the majority of February preparing our home for sale in Northern California locally referred to as the "Napa" of the North. We have our very own neighborhood vineyard Grey Fox and orange orchards all around. The oranges have fresh new blossoms ready to burst next sunny day. Our windows have never been so crystal clear so now it's on to tiger stripes! These stripes were colored with clays and non gelled for a velvet texture. There is a touch of salt on the top for fun! I will use a different technique pouring next time and that should help, pouring from side to side not up and down the mold! So here is Salt Water Taffy!! This time the stripes were a little ah squishy so I named the soap for salt water taffy. Fragrance was added to each color with a different scent and it does smell like a luscious citrus y salt water taffy. It is still a touch too soft to cut so I thought I'd play with the cropping of the photos and the color brightness and contrast setting and show the differences. Untouched color but cropped photo. This photo is untouched not even cropped. 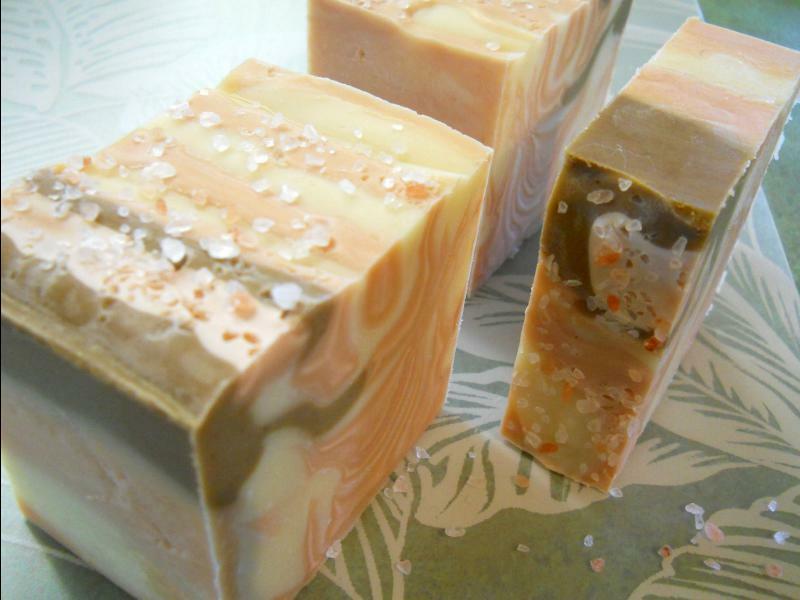 First soap using Cambrian Blue Clay for color. Firsts don't you love them! 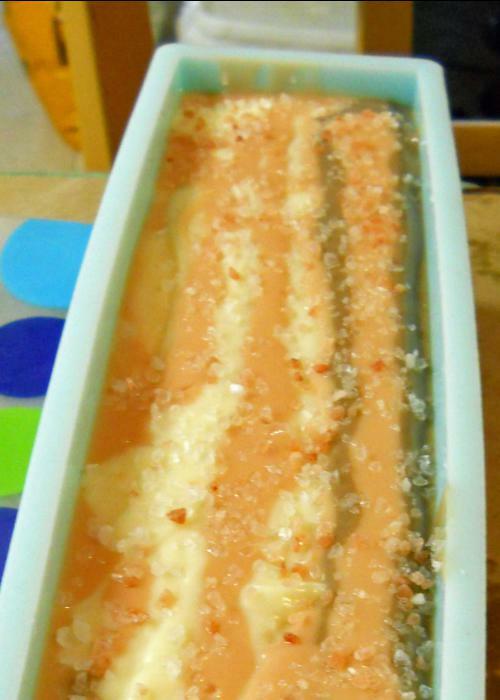 This soap bar is made with Cambrian Blue Clay from Russia. 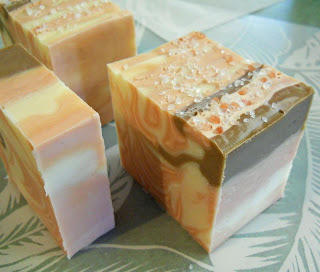 I like the color and will do another soap using this clay in the future. 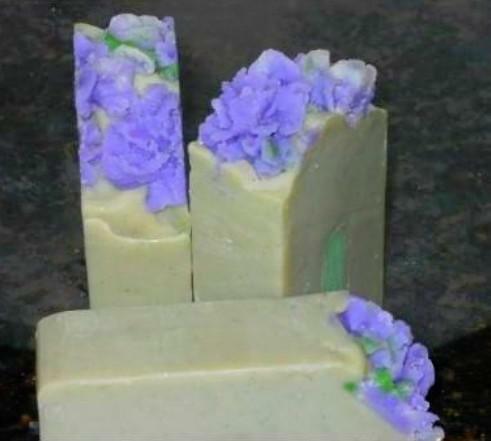 The hydrangea flowers were added for contrast and to dress up these bars for Easter or Mother's Day or maybe just Happy Spring everyone! 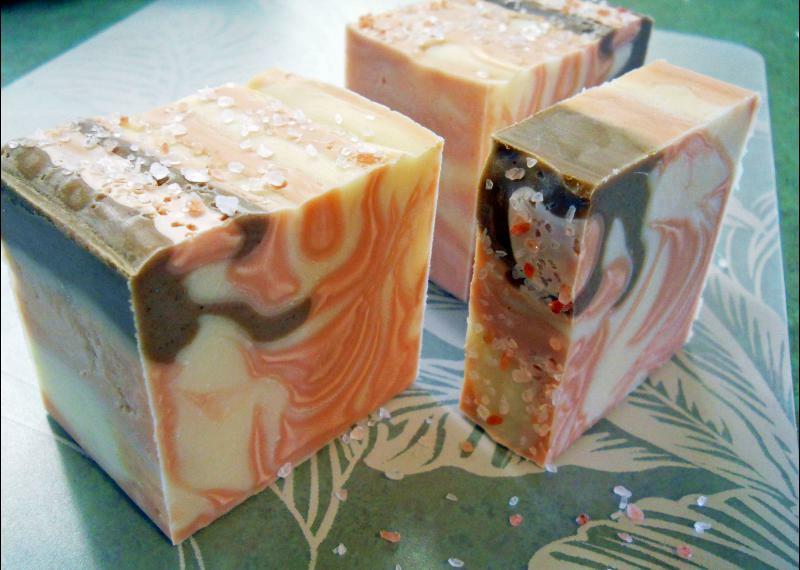 One batch of this soap went to a swap! Notice the bright color flowers a "thank you to Kyme" ~~ Alamo Calendaria for inspiring this soap Hydrangea Flowers for inspiring this soap! Hoppity hop on over to Amy's blog and check out all those interpretations of tiger stripes some very beautiful soaps! Kyme's might just be my favorite!